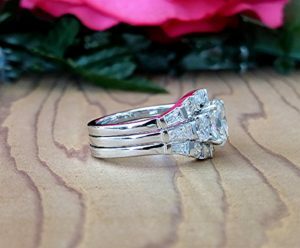 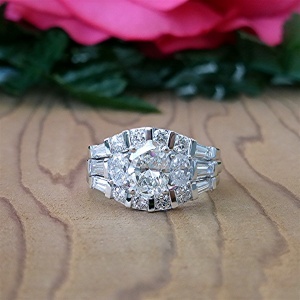 Engagement ring has a 1.34 carat H, VS oval center diamonds with a pair of 0.54 carat side ovals following a pair of 0.35 carat taped baguettes. 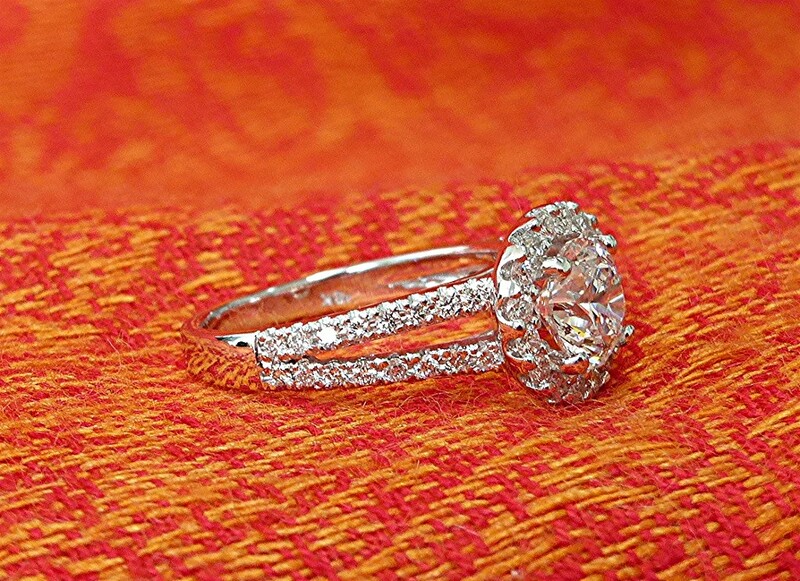 Total diamond weight on engagement ring is 2.23ct. 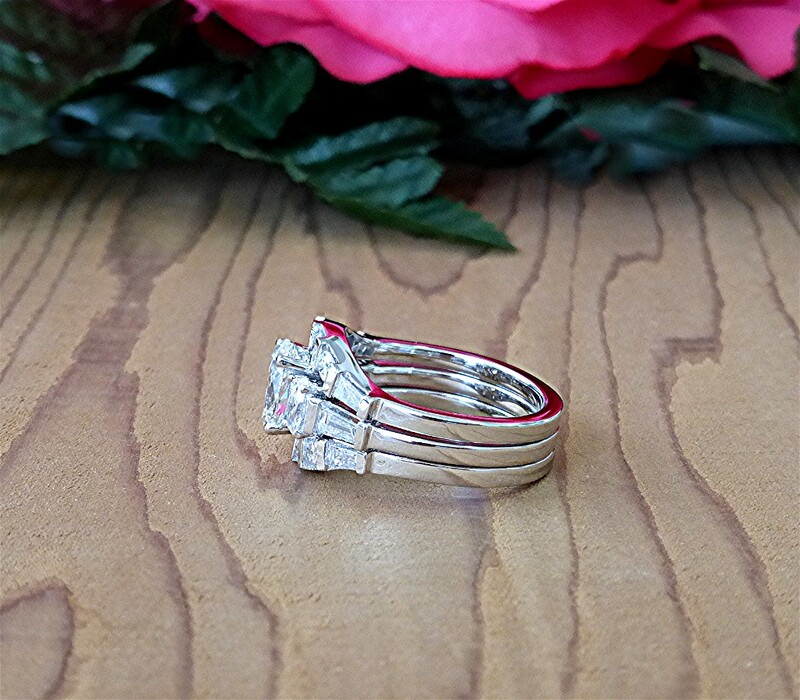 The identical matching bands, each, have four RBC 0.26 carat, following by two side baguettes measuring 0.15ct. 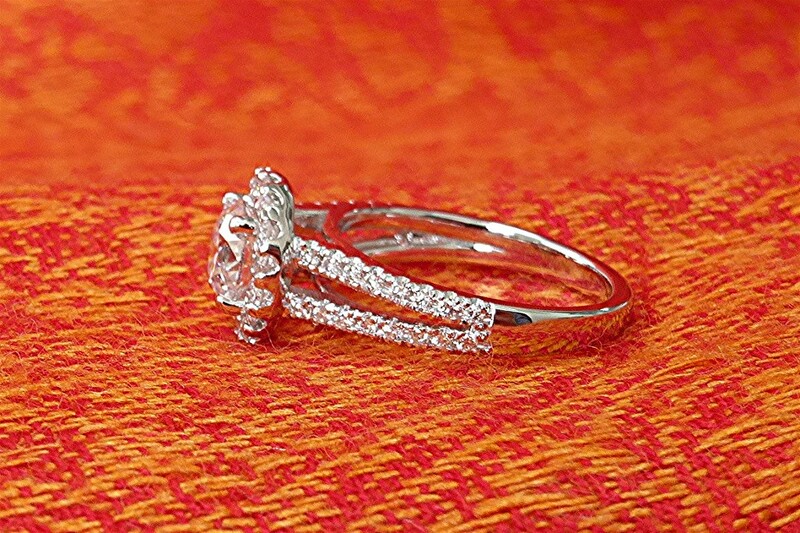 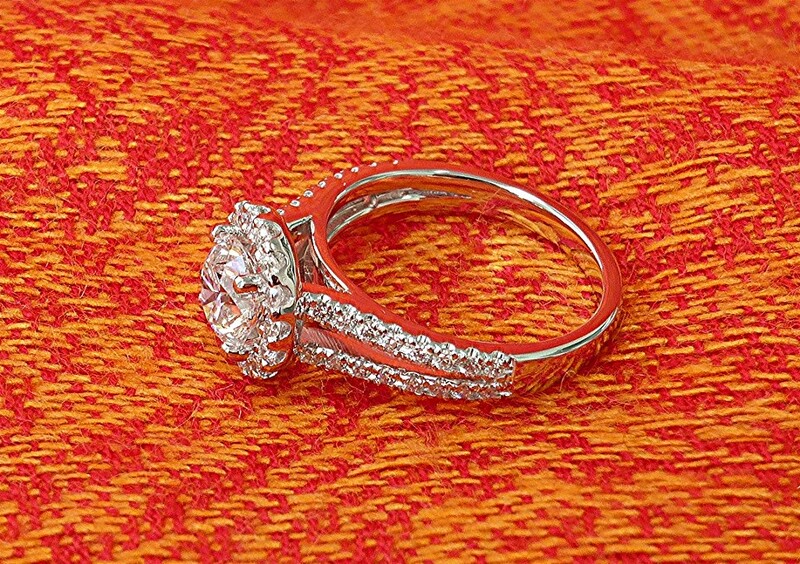 Total diamond weight in each band is 0.41ct. 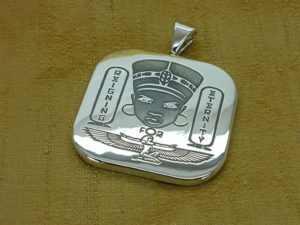 Mounting is made of 14k white gold. 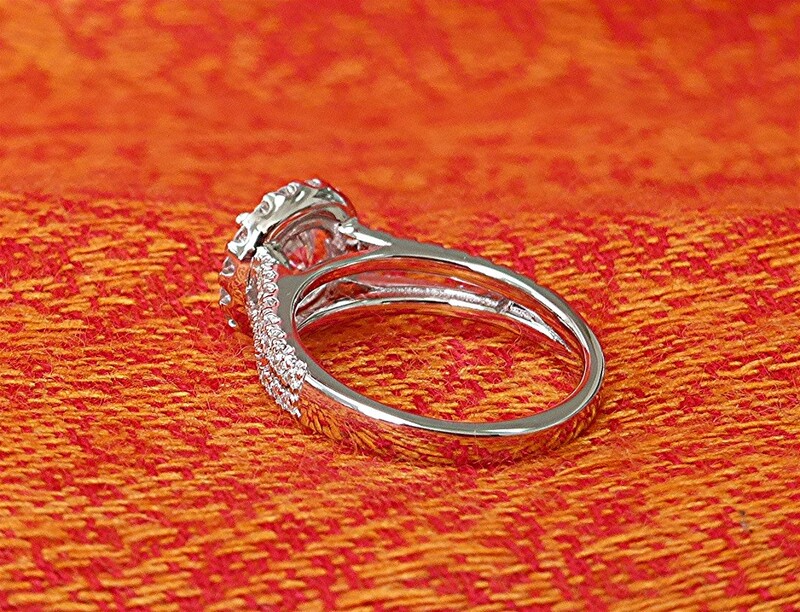 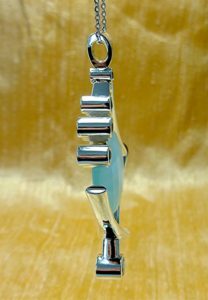 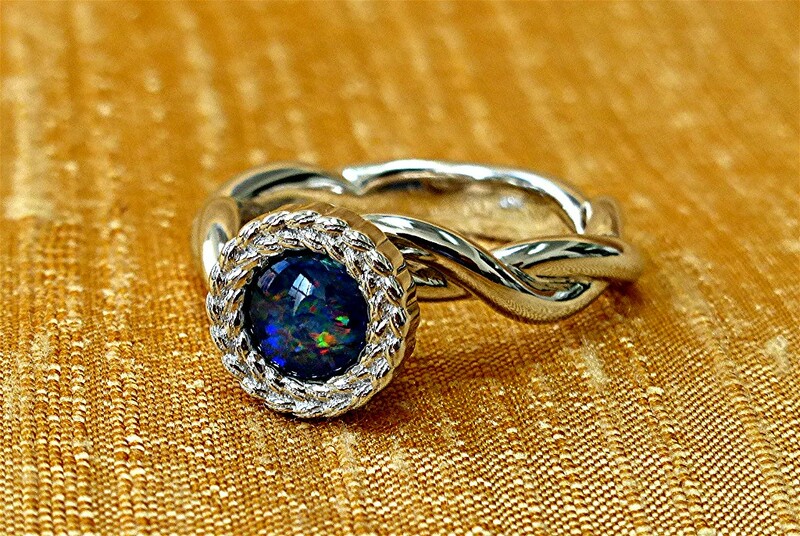 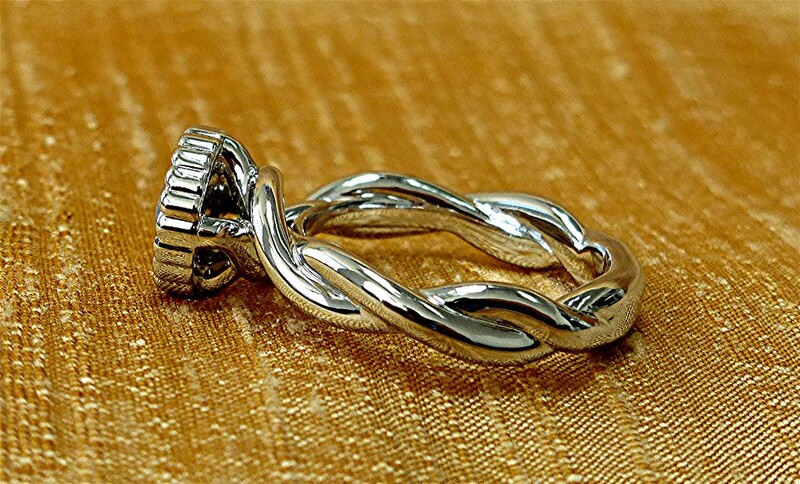 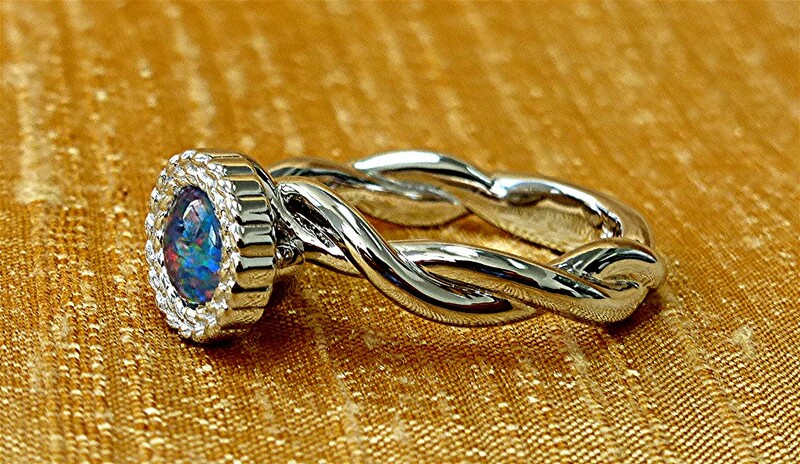 Twisted shank with wheat design bezel head Made of 14k white gold. 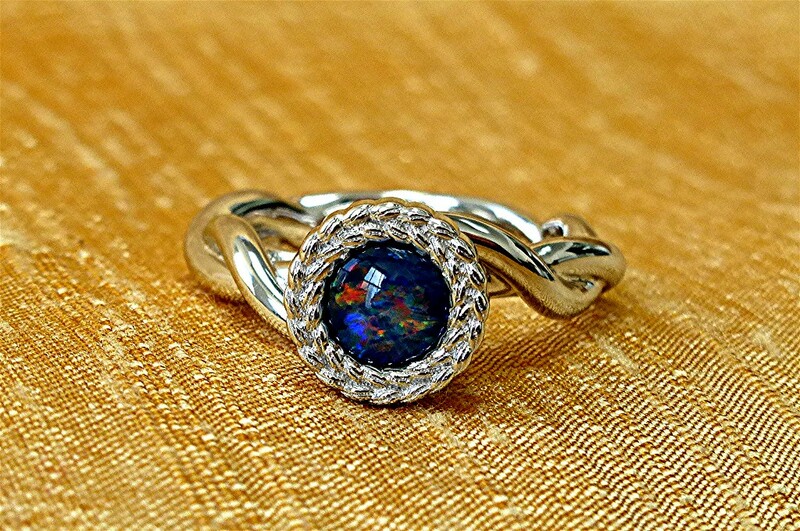 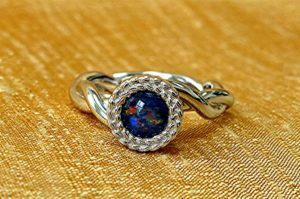 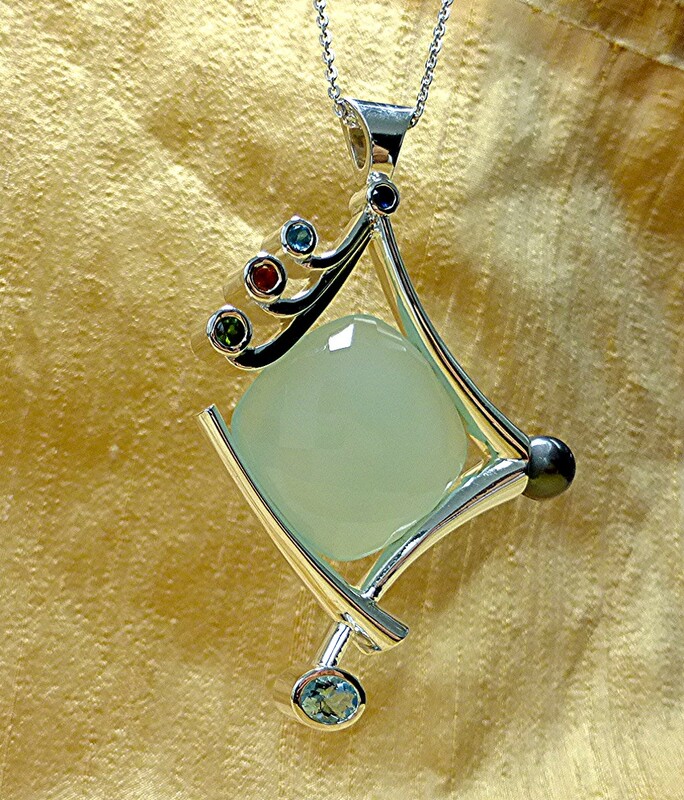 Center stone is 6mm cabochon opal. 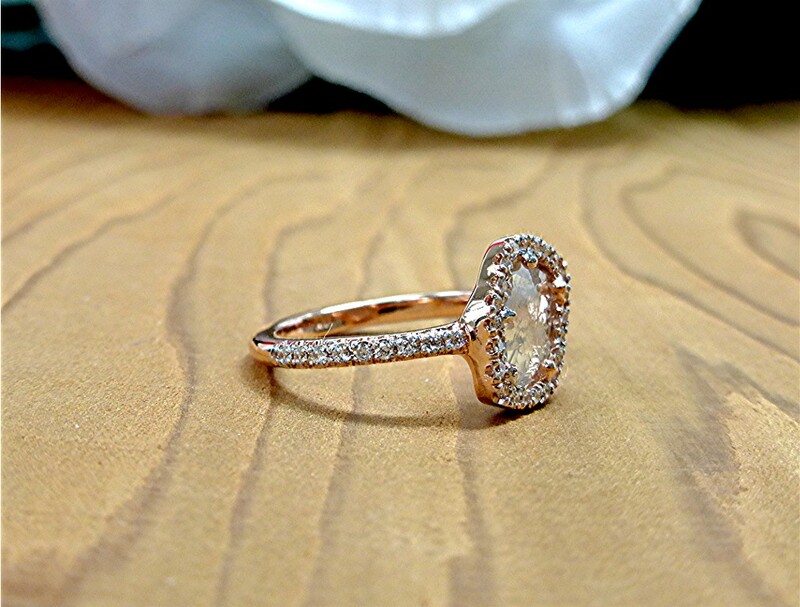 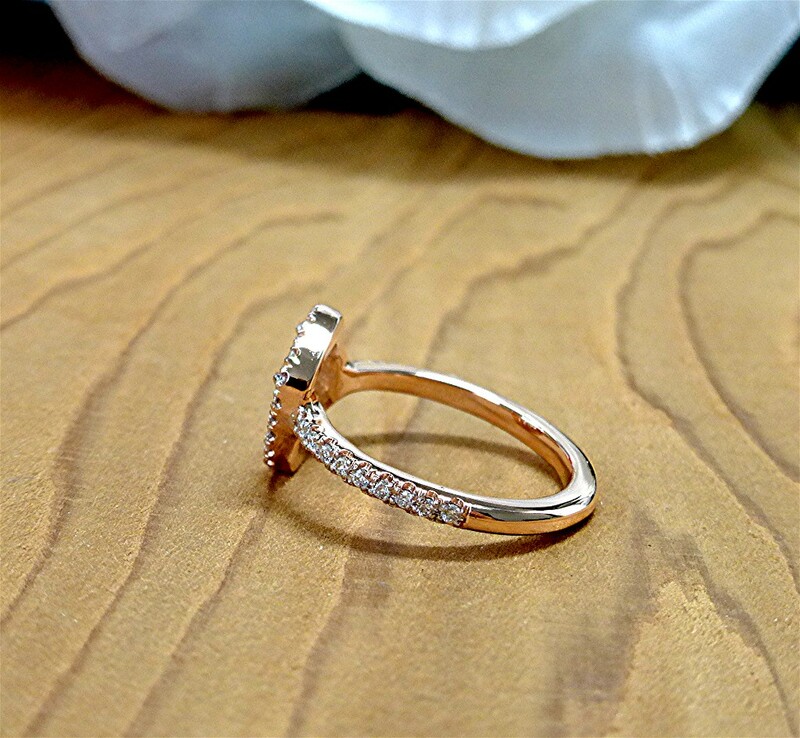 It is made of premium 14k rose gold. 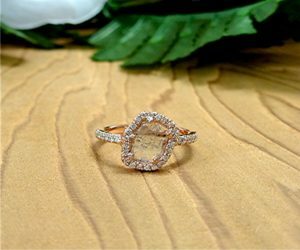 Center stone is one of kind 0.39 carat slice diamond. 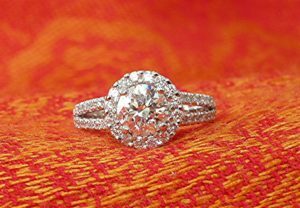 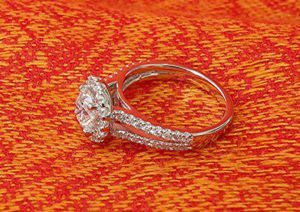 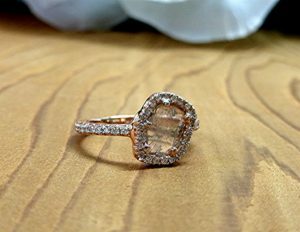 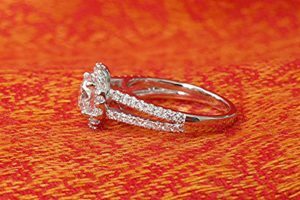 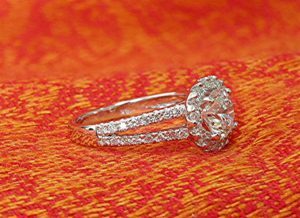 Fort round brilliant cut diamonds weighing 0.26 carat are set in halo and shank of the ring, total diamond weight is 0.65ct. 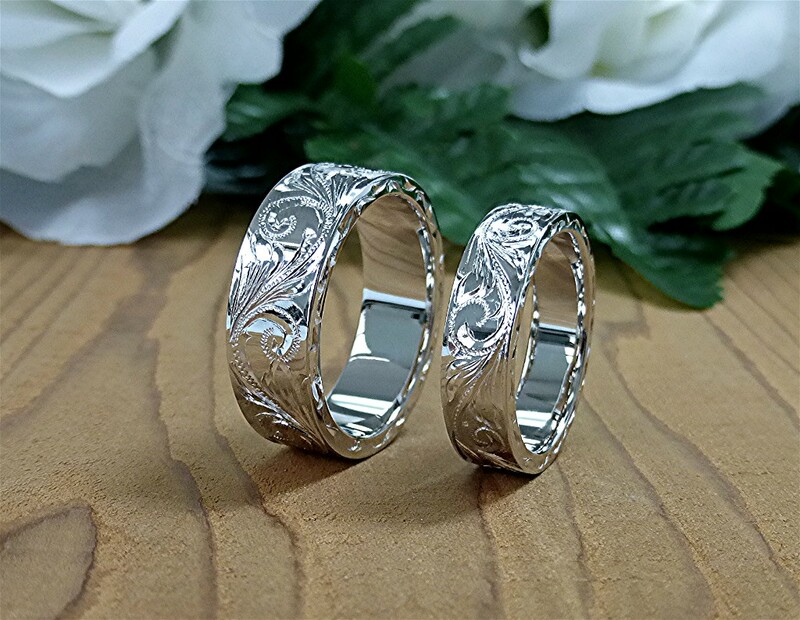 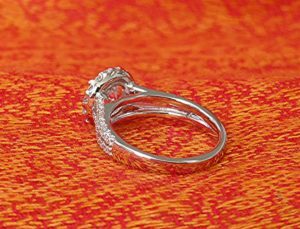 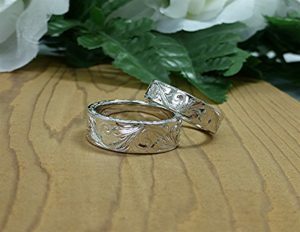 Set of 14k ladies and men’s wedding band. Mounting is made of 18k white gold with 16 RBC sheared prong set diamond on halo and 32 RBC (micro U set) diamonds on split shank. 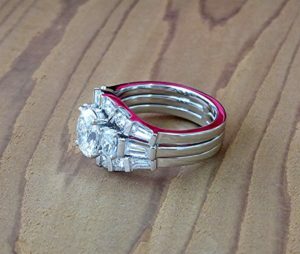 Center is 0.93ct. 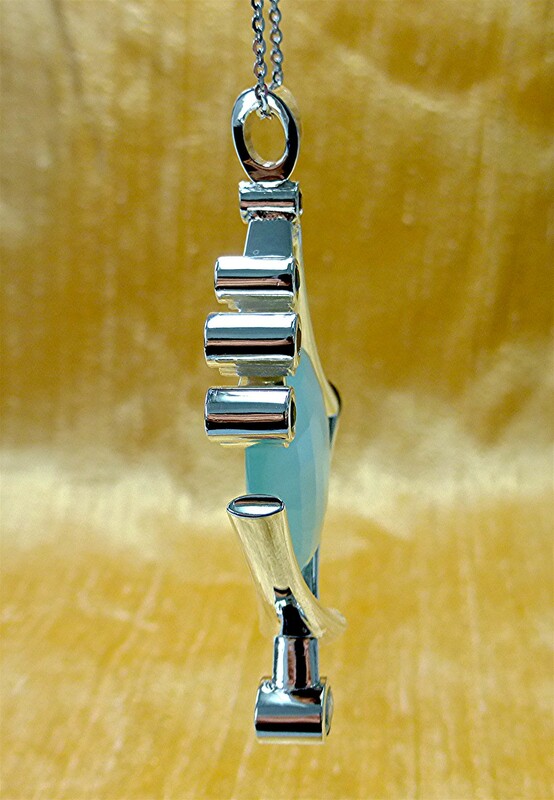 RBC measuring 6.16×6.16×3.98 mm prong set. 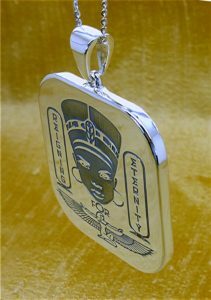 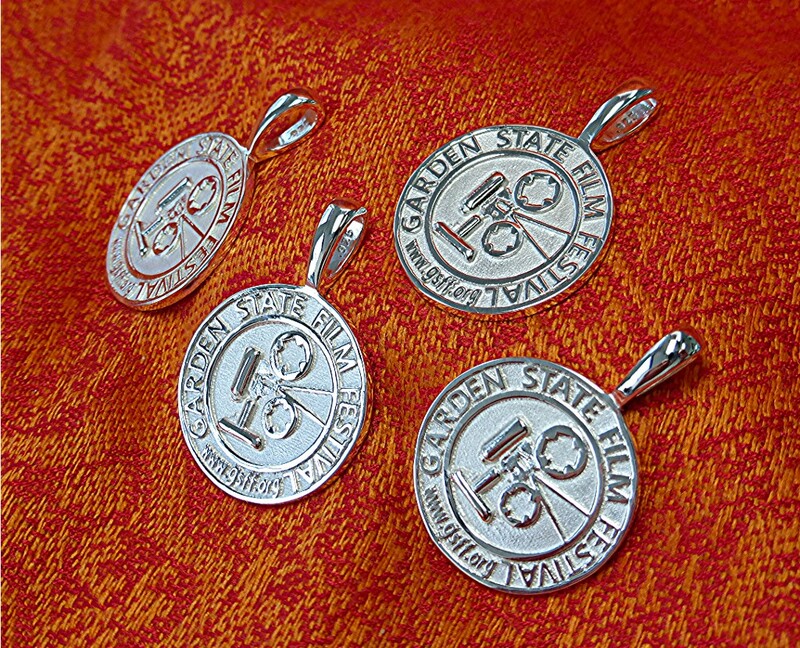 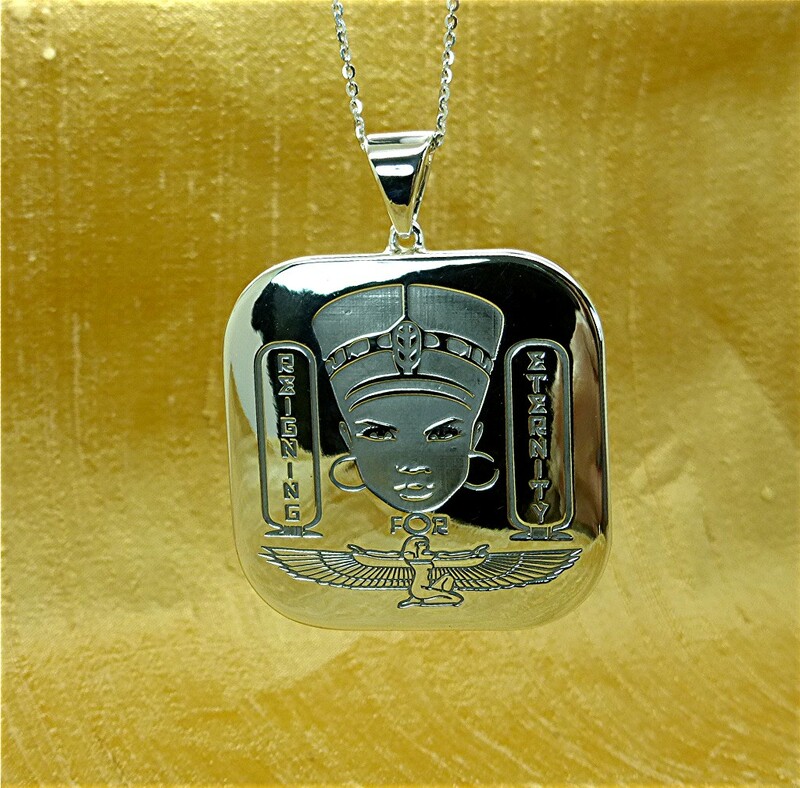 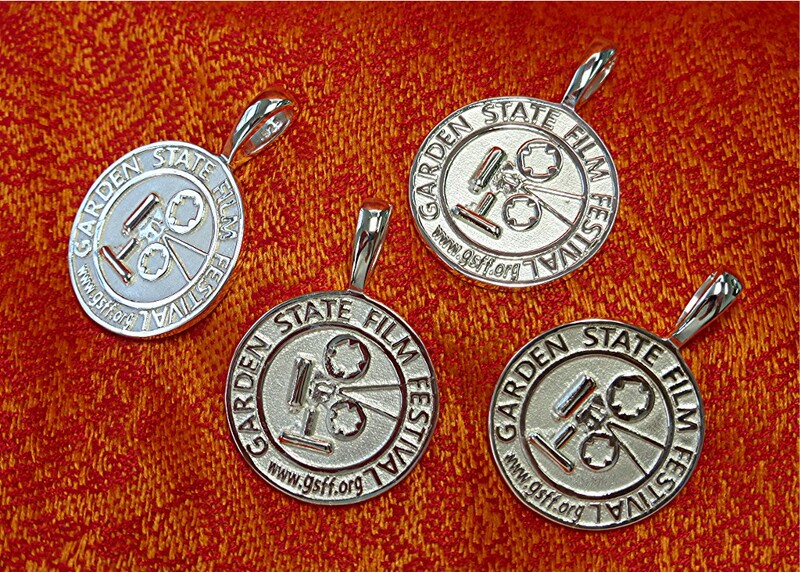 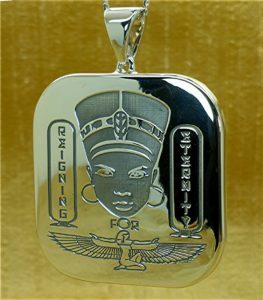 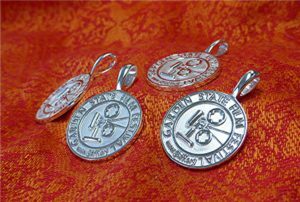 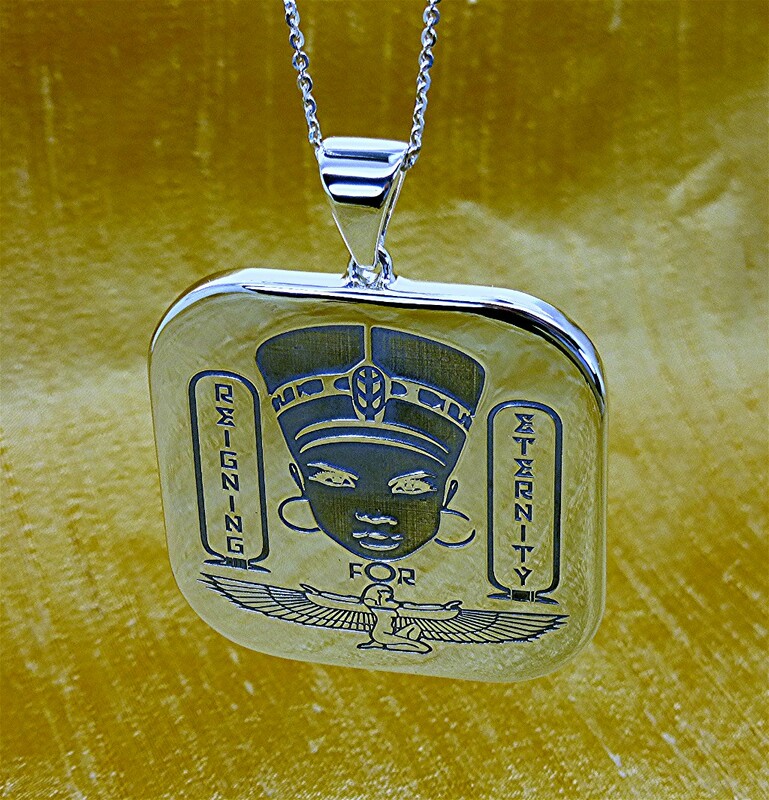 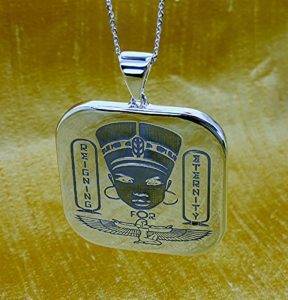 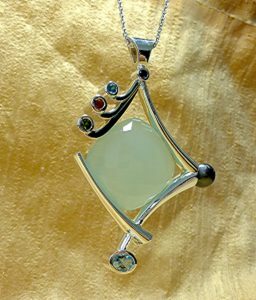 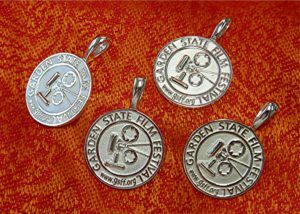 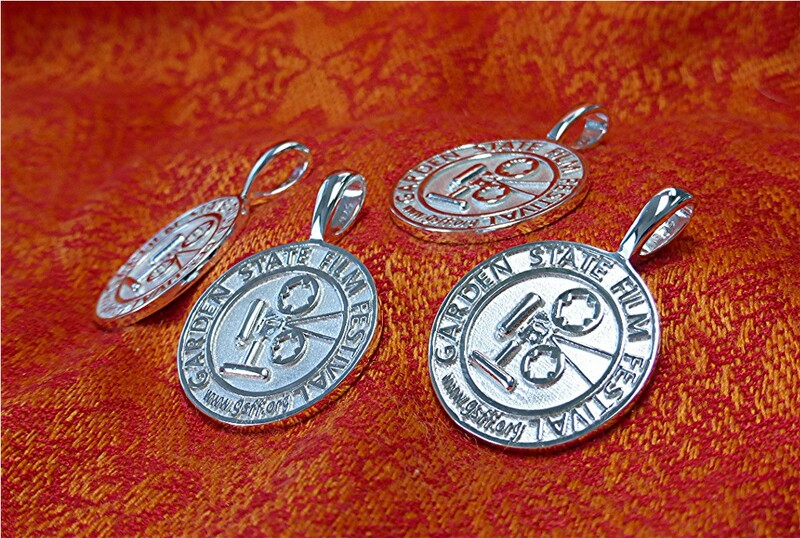 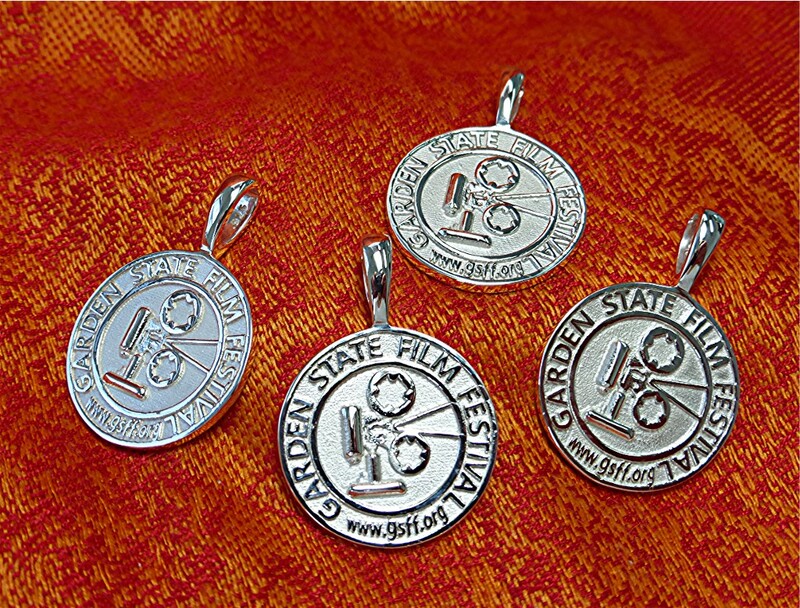 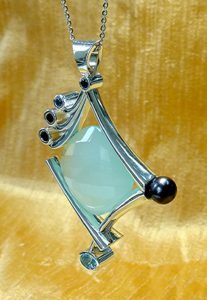 Pendant is made of Deox silver. Laser removed area is oxidized to highlight the design. 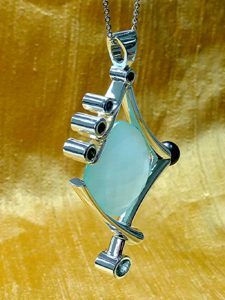 Center stone is checkerboard flat Aqua Chalcedony (25.8mm) set in channels in four sides. 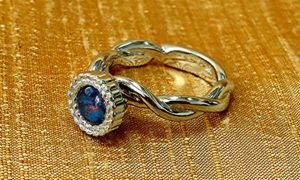 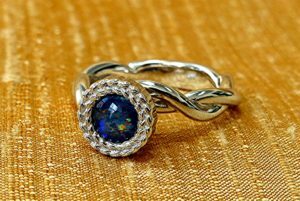 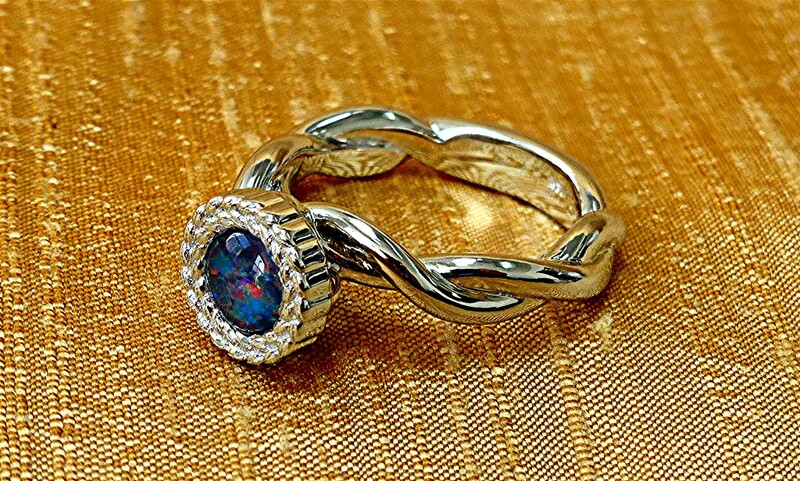 Ten bezel set color stones are 2.9mm sapphire 0.21ct. 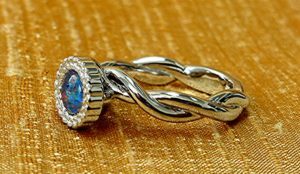 , 3mm blue topaz 0.29ct. 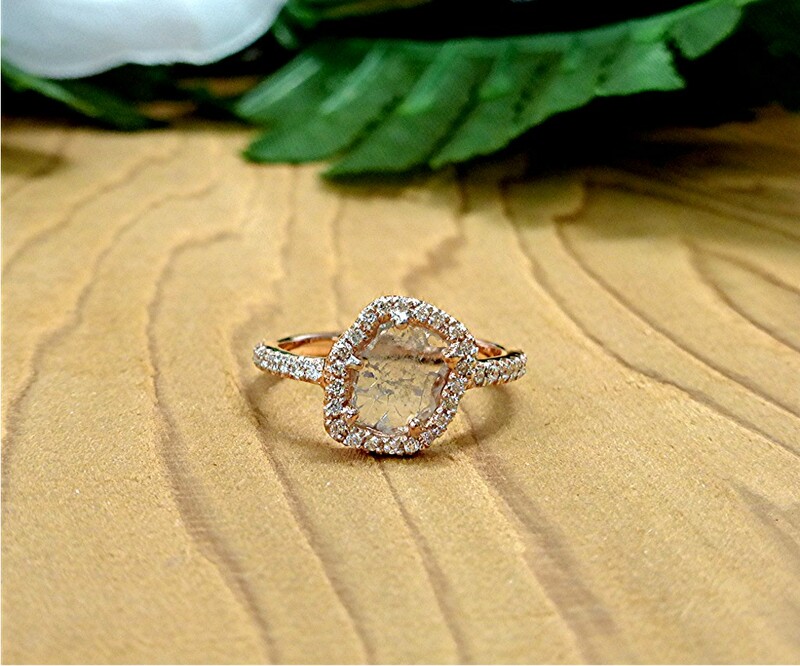 , 3.5mm citrine 0.34ct. 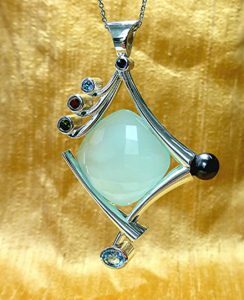 , 3.5 mm green tourmaline 0.38ct. 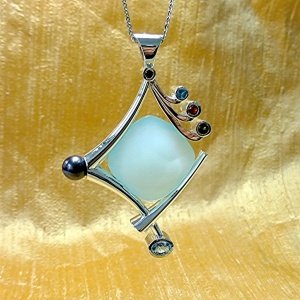 , 7×5 mm oval aqua marine 1.20ct. 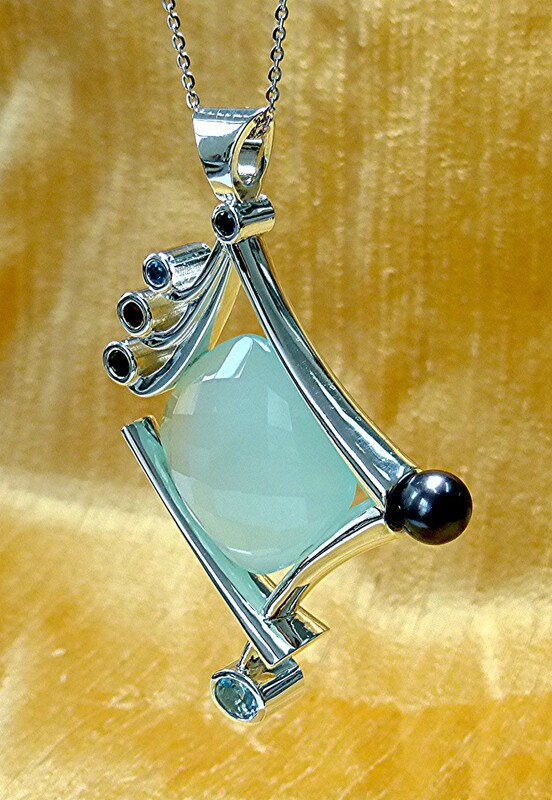 On the side there is genuine 8.5mm black cultured pearl, and metal is satin finished Deox silver. 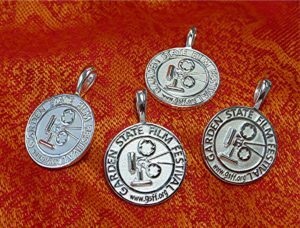 Pendant is of Deox silver with extruded logo design and sandblasted background.